Puede seleccionar como máximo 13 viajeros en total. Experimentar lo mejor de Granada puede ser difícil para los viajeros con tiempo limitado. Aproveche al máximo su visita en un recorrido de un día completo por los lugares destacados como Concord Waterfalls, Diamond Chocolate Factory y Grand Etang Lake, ahorrando tiempo con el traslado de ida y vuelta incluido desde su hotel o puerto. Con esta guía, obtenga una visión íntima de la historia y la cultura de Granada mientras explora los fabricantes que trabajan, las antiguas plantaciones y los emblemáticos puntos de referencia naturales. Evita costes ocultos con entradas incluidas en el precio. We were picked up promptly, only one other couple with two boys on the tour. 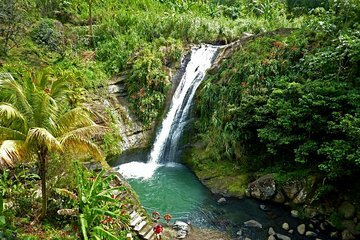 Plenty of time to see the waterfall, Nutmeg Receiving Station, Chocolate Factory, Rum Distillery and Grand Etang. Lunch was included and as our driver got there before other buses we had a great table outside. Food wasn't great and not very hot but it was okay. A very good value for money tour picked up at 9am and got back to resort at 5pm - very very informative and knowledgeable driver "Rawle" would totally recommend this tour for a real insight into Grenada. Michael, our guide, was amazing - was born on the island so able to give us so much history and information (and he knows everyone on the island as well!). Really informative day --- get to see most all that the island is famous for (spices, beaches, rainforest, cocoa making, rum and winding roads! ).Recommend this tour for all ages!